Tiny toy objects play big in the minds of kids. 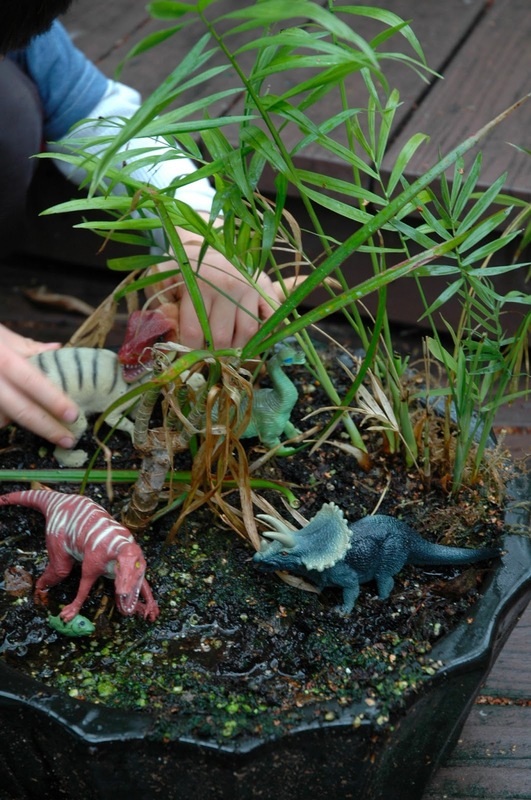 Small world play unleashes the potential of a kid's flexible imagination to both focus and expand moment-by-moment. Beyond doll houses and Legos, two mainstays of small world play, there's many great ideas from the crafting and kid play community. 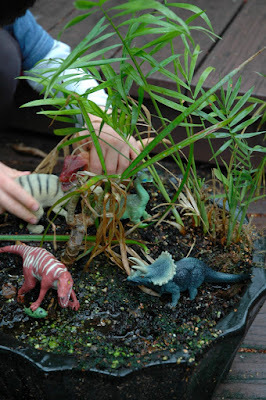 Check out my Pinterest board on small world play. 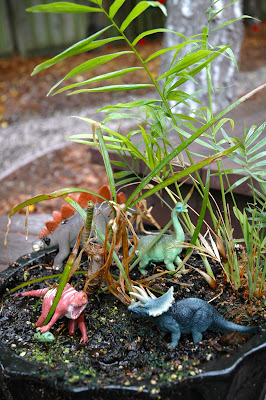 I'm digging the fairy gardens, though we'll have to work up to the level of sophistication of the gardens I've pinned! At preschool this winter (bye!! ), my guy made a bear cave (pictured at top), and if he's lucky we'll make a winter wonderland this weekend using shaving cream! For now, I'm happy to keep it easy. During a break in our rainy days, we played dinosaur outside by turning a planter into a terrarium. We were on Kiwi Crate this week! I know what you’re thinking. I’m getting thin on ideas, right? Well, maybe. But consider this a twist on the usual. I wrote this one up because of how my son surprised me by what he did with such everyday ingredients. It’s early on a Sunday, and I’m up with my 5 year-old son and infant while my hard-working husband sleeps in. The morning sun streams through the window, illuminating our marshmallow sculptures we made (an oldie but goodie inspired by a recent post from The Artful Parent). Old man winter finally woke up and puffed a nice blanket of powder up in the Sierra mountains last week. Luckily, we were able to make the trek over the weekend to play in the snow with friends. Skiing, sledding, snow ball fights – we did it all! We often make a requisite snow man too, though this time we tried making sculptures by dripping water onto snow. We filled water bottles with water. I was thinking the kids would at least get a kick out of squirting water on the snow (if not on each other).